Happy birthday to my husband. He is an amazing man, father, lover and friend. And he loves my cooking. So for tonight, I wanted to make him a nice dinner. But of course, I still have the kids to take care of today, a house to clean before company and a dog that is begging to go out, so my options for fine dining were a little limited. I decided to start a crock pot of food at lunchtime instead of at breakfast— our dinner will be done right as the kids are going to bed… so we can eat a meal as adults and maybe even partake in a glass of wine. I had totally planned on doing chicken fajitas for dinner tonight or some sort of hearty “man” food, but my hubby went out with his coworkers for lunch at a Mexican restaurant, so I needed to reroute my dinner plans. 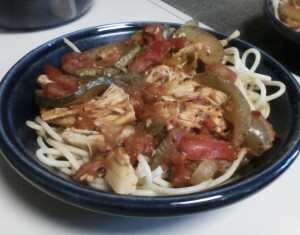 Since I already had the chicken, I decided to make chicken cacciatore (pronounced catch-ahh-toe-ree) instead. It’s robust and filling, but an easy one pot meal. Cacciatore is usually served over a thin pasta like angel hair, but it can also be served over rice, if you prefer. I like to top mine with grated Parmesan cheese instead of putting the cheese in when it’s cooking. You can also add other vegetables if you’d like– many cacciatore recipes add mushrooms and/or fresh basil leaves. You don’t need a celebration to dine on this great chicken dish. Enjoy! Combine vegetables in crock pot, top with all seasonings and stir together. Pour in tomatoes and sauce and stir again. Place frozen chicken breasts on top of mixture. Cook on high for 4-6 hours. Serve over thin pasta or rice.